Classic Collectable Interesting & Unusual vehicles inc motor cycles and commercials. 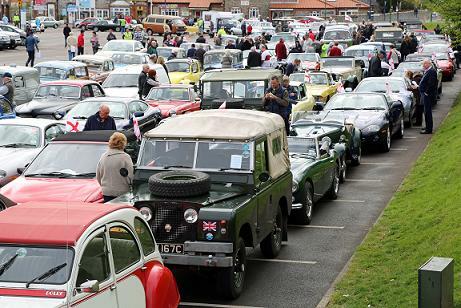 The run will start from Station Road Car Park, Sheringham NR26 8RE with the line up starting from 8.30am with the first vehicles being waved away at around 9.30 am. Don’t forget to fly your flag of St George! There will be two routes going through the North Norfolk countryside which will finish at the Royal Estate Sandringham . Light refreshments including bacon butties will be available at the start. The visitor centre at Sandringham offers a wide selection of refreshments including lunch and tea. The NNCVC are pleased to invite you to join us with your classic, collectable unusual or interesting vehicle for our run in 2019 which is part of the �Drive It Day� initiative of the Federation of British Historic Vehicle Club. Cars, commercial vehicles, motorcycles and military are all welcome.